With our schedules on full speed lately, prepping breakfast, lunch and dinner (oh and the coffee!) the night before has become somewhat mandatory to survive. Yes, that sounds dramatic, dramatic and truthful. Because the moment you forget to make lunches the night before, everything just feels off that morning. We are scrambling around the house, eating breakfast, packing lunches, trying to find backpacks, and library books and questioning whether or not it is ballet day or or music. 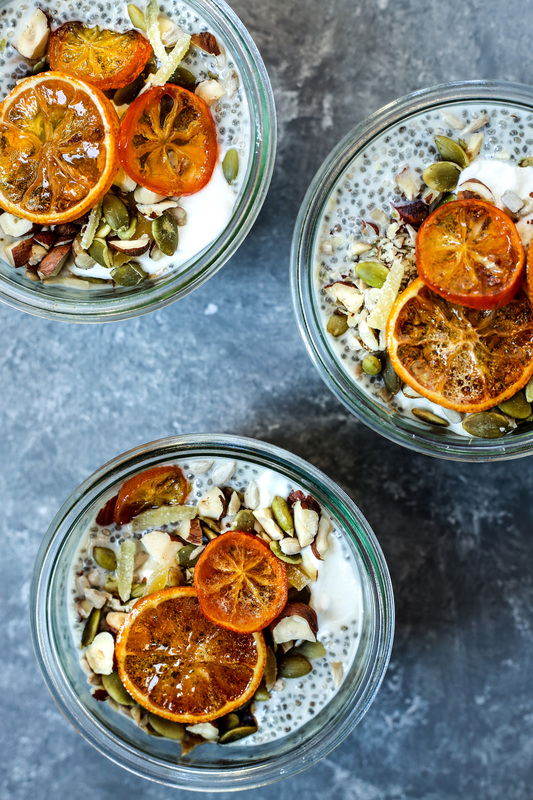 In a bowl, combine the milk, chia seeds, lemon zest and maple syrup. Let sit aside for 30 minutes, stirring every so often, until thick. Thinly slice oranges and set aside. In a large skillet bring water and sugar to a boil, stirring to dissolve the sugar. Add the orange slices to the skillet in a single layer. Reduce the heat to a very low simmer, flip them about every 10 minutes, until the oranges are translucent, about 40 minutes. Remove the skillet from the heat and allow the oranges to cool in the syrup. 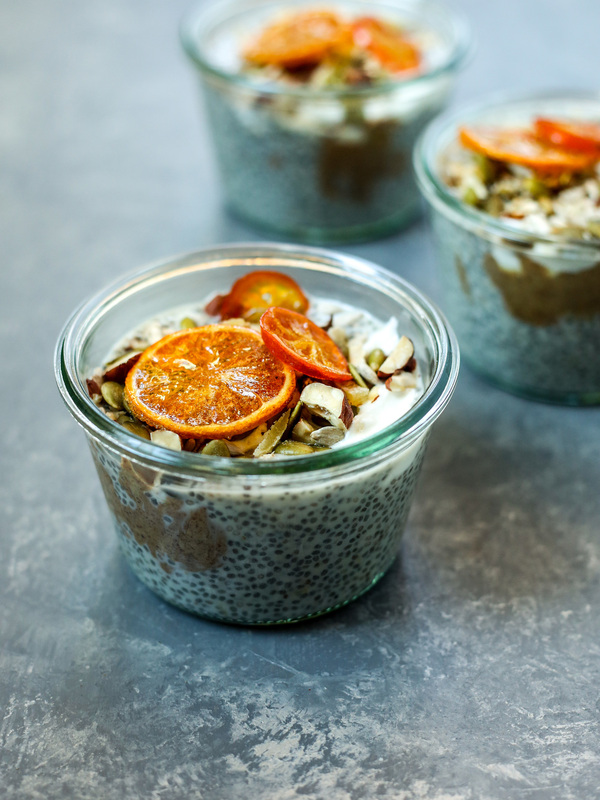 Layering: Place a 1/3 cup of chia pudding in the bottom of 6 small glasses. Then add a dollop of nut butter, followed by a few spoonfuls of yogurt. Finally top with Sunflower Seeds, chopped Hazelnuts, Candied Ginger, Pepitas, and 2-3 Candied Oranges. Drizzle over some extra honey or maple syrup if preferred.